6 Bedroom Detached House To Rent in Henfield for £3,950 per Calendar Month. The accommodation is spacious and well-planned with three principal reception rooms leading from the entrance hall. The entrance hall and many of the rooms feature stripped period wood flooring. The sitting room has a large inglenook fireplace with a wood burner stove and there is an open fireplace in both the drawing room and dining room. The sitting room and drawing room both have a south-facing bay window. 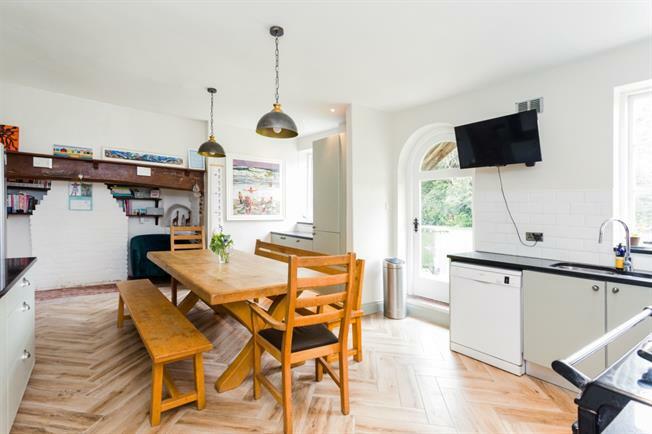 The kitchen/breakfast room features a 4 oven Aga, a former inglenook fireplace, an extensive range of built-in units and a walk-in larder. Off the inner hall is a utility room with a range of fitted units and cupboards, an inset butler sink, and spaces for a washing machine and tumble drier. On the first floor are 4 large bedrooms and two bath/shower rooms. The principal south-facing bedroom features stripped wood flooring, a roll top bath and an open fire. A further south-facing bedroom also features stripped wood flooring and a shower room. The second floor provides excellent 2 bedroom bedrooms and bathroom It currently features a bedroom, sitting room, study and shower room, but can be adapted as bedrooms or a self-contained suite as required. The property is situated just off the High Street in the heart of Henfield, a thriving village to the north of the South Downs. The village has many local shops, pubs, restaurants and services, and holds a large number of popular village events throughout the year. Other facilities include a leisure centre, sports clubs, drama and youth groups, a library and churches of most denominations. There is an excellent selection of schools in the area including Brighton College, Hurstpierpoint College, and Lancing College, all of which have dedicated bus services from Henfield, along with St. Peter's Church of England Primary School. In the surrounding countryside there are many miles of beautiful walks and rides, including the Downs Way which runs from Guildford through the village and the South Downs to the coast. Golf at Singing Hills (Albourne), The Dyke (Brighton), or Mannings Heath; Cricket at Henfield Cricket Club or Preston Nomads Cricket Club; Football at Henfield Football Club; Tennis at Henfield Tennis Club; Rugby at Brighton Rugby Club; Show jumping and eventing at Pyecombe, the All England Jumping Course at Hickstead and Borde Hill, near Cuckfield; Sailing at Brighton Marina; Theatres at Brighton, Horsham and Chichester; Opera at Glyndebourne. A secluded enclosed courtyard adjoins the east elevation and provides access to a self- contained annexe which comprises an open plan room with exposed timbers and a vaulted ceiling, shower room and 2 bedrooms. The indoor swimming pool is set in a paved surround with sliding doors opening to the garden.